Want to join the 44 million Americans who currently have a side hustle? We don’t blame you. Earning some extra money on the side is a great way to pay off debt, save for a rainy day, or simply earn some extra spending cash. 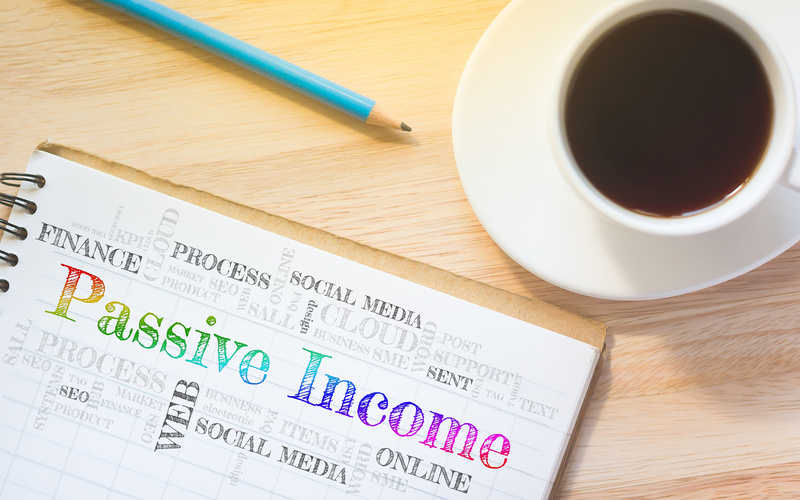 Let’s get into the top passive income ideas that’ll allow you to put your creativity to the test! Do people always tell you that you have a way with words? Are you passionate about your career or hobby or just love sharing ideas with the world? Creating a website is inexpensive and fun, and it really lets your creativity shine. As far as passive income ideas go, you can make some serious income through affiliate marketing via your blog. Do you like to knit or take stock photos or create funky outdoor banner flags? There’s a marketplace for that. In fact, many people love supporting local artists and are happily willing to spend their hard-earned money on one-of-a-kind goods. Selling art represents both either be active or passive income ideas. Sure, you’ll have to make the art (which requires time, energy, and materials). But, with certain types of art (such as photos or graphic images), once it’s made, it’s made. All you need to do is sell it! Whether it’s taking surveys, playing games, or simply watching funny videos, there are plenty of apps and websites that allow you to make money just from your couch. Consider looking up websites like Swagbucks or MTurk. With these companies, you can sign up and earn points redeemable for rewards like gift cards or Paypal certificates. This may be one of the very best passive income ideas (even if it doesn’t seem all that glamorous or exciting). That’s because when you invest, you make dividends, and you reap the benefits of compound interest. All you need to do? Let your money sit and ride out the ups and downs of the market. And, you don’t need to be a wealthy millionaire to get started with investing. Certain apps and websites allow you to fund your portfolio with as little as $100. Do you have unused driveway space? What about an extra guitar that you no longer use? Maybe you have a spare bedroom now that your roommate moved out. Taking advantage of extra space or things is one of the best passive income ideas for those looking to make extra money- without all the time and hassle of another job. From Airbnb (renting out some or all of your home) to Turo (renting out your car) to Sharewood (renting out sports equipment), there’s a service for anything and everything extra you may have lying around. Before renting out your stuff, just make sure that you fully understand all the terms and limitations. This will help protect you in case emergencies happen. Did you know that you can actually buy music royalties? This means that having ownership of those rights gives you the ability to earn money on all the earnings. Royalty rights can provide a lucrative stream of passive income- they also don’t require tremendous effort or strategizing. Check out bidding royalties through the Royalty Exchange website. Try your hand at buying and selling real estate or becoming a landlord. It’s one of those passive income ideas that can actually become a full-time investment strategy when done well! With that said, real estate obviously entails some planning and strategizing. You will need to have financial smarts and discipline in order to succeed at the game. Real estate is a timeless industry- that means it’s not going anywhere anytime soon. You can start with a single rental house and work your way up to several at a time. Just make sure you spend your thorough time researching. Want to share your thoughts with the online world? Got a knack for doing silly things on video? Or, maybe you’re passionate about a certain topic and would love to provide informational videos? Why not consider making and hosting your own Youtube channel? Just like other entertainment mediums, this is a great way to gain exposure and build a following. It’s also a great way to work with other companies and sponsorships to accrue extra income. It may seem counterintuitive (you know, to spend money), but there’s actually some merit behind this one. Let’s say, for example, you’re looking to buy a pair of shoes online. You need a new pair, and you were planning on buying them no matter what. If you use a shopping portal, such as Ibotta, Ebates, or Swagbucks, you can earn a percentage back from your purchase. These percentages can range anywhere from 1-30%! Many of these portals have Chrome extensions, so that’s worth looking into if you’re a regular online shopper. Best of all? Many of these sites run flash sales where you can earn double or triple of the earnings. Outgrown your old clothes? No longer need those college textbooks or miscellaneous items lying around? Recently upgraded your laptop or cell phone and no longer need your old one? Selling your stuff online or in-person is a great way to make extra money with minimal effort. Today, you can sell everything from clothes to old phones. Make sure you shop around to get the best quote. Oftentimes, these companies also cover the costs of shipping and handling. Use your creativity and skill set to generate extra income. Who knows? You may end up making a ton of extra money! Interested in learning more about career growth and tips? Be sure to check out our blog.